With pumpkins still growing in many of our local Ventura fields, and Thanksgiving just around the corner, Fall is upon us as the air gets slightly cooler with those hot intermittent Santa Anna winds. These changes give me cause to reflect upon the work that KIRF has done this last year: Helping people change their own lives with better education, health, sanitation and job skills. It seems like only yesterday when KIRF, in partnership with the Rotary Club of Venture, made a trip to Brooklyn, New York to work with the Occupy Sandy volunteers in New York City to provide food, cleaning supplies, and infant needs to many who were still in need of assistance from Hurricane Sandy. 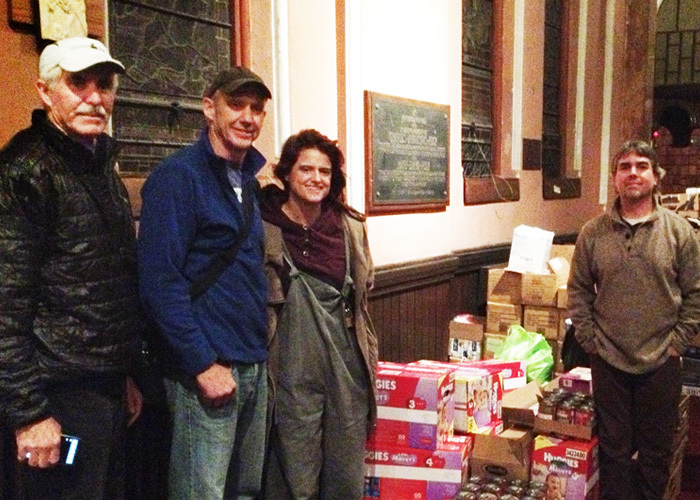 You can read more about our Hurricane Sandy disaster relief in last December's field report. KIRF volunteers also made several trips to Nicaragua this past year, once again partnering with the Rotary Club of Ventura and our new local Nicaraguan community service partner in Playa Gigante: Project WOO. Project WOO (WOO stands for "Waves Of Optimism") is a local non-profit founded an international network of surfers and humanitarians who wish to give back to the economically disadvantaged coastal community of Playa Gigante through environmentally sustainable education, job-creation, and health programs. 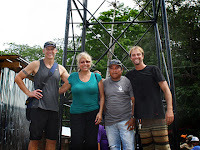 To make sure they they were really helping the local Nicaraguans, Project WOO formed a local village community health committee. Through door-to-door assessments, the health committee discovered that the community needed a local health clinic. Once a local land owner donated a portion of his land, the design and procurement of funds for the new Gigante Community Health Center began shortly after. In the past year, KIRF and the Rotary Club of Ventura have worked with Project WOO and have purchased the materials and labor to drill a well and install a water tank for the clinic. After Project WOO secured funding for the clinic's first year of operational costs, and got partial building funding from their own fund raising online and from local Nicaraguan businesses, KIRF and Ventura Rotary assisted the health clinic project by purchasing the labor and materials to build and install the clinic windows and doors. We also purchased the septic tanks, sinks, toilets and pluming for proper sanitation, and roofing materials. With a local health clinic in Playa Gigante, people from community would not have to travel over 2 hours for emergency medical treatment of injuries and disease. KIRF is collaborating with Project WOO and the Rotary Club of Ventura to complete the construction of the new Gigante Community Health Center. This local health clinic will also provide preventative medicine education, including hygiene, and health care education and treatment for women. You can read more about KIRF's support of the construction of the new Gigante Community Health Center in our field report. KIRF continues to support the women’s sewing center at the Shekhwara Village School in rural Bihar, India. The sewing center has been a huge success since we started it in 2009 with a modest investment in non-electric sewing machines, textiles and a small stipend that pays for a local seamstress sewing instructor. The Sewing Center is educating local young women in the skills of making clothing using sewing machines and materials we purchased. We have a dedicated teacher who has seen graduates of the program make and sell their clothing which helps support their rural and poor lower caste families. Several years ago, I had the pleasure of walking from the Shekhwara Village School (then called the Kirwin James International School), which houses the sewing center and weekend family health clinic, to the surrounding villages where the students live in their traditional homes of mud walls and thatched roofs. The kindness of the people, the cleanliness of their mud huts, and the vibrancy of their colorful saris, will remain a wonderful life-long memory. Since that visit the school has grown and a field report on its growth is coming. In the meantime, you can learn more about the Shekhwara Village School and it's free family Health Clinic and Women's vocational training at the Sewing Center in a 2012 field report, or for more recent updates with lot's of photographs, our Facebook page Facebook.com/KIRFaid. We are pleased to announce that KIRF has a new home at the law firm Kirwin Becker Law Group, located at 4480 Market St., Suite 804, Ventura, CA 93003. You can reach us during office hours Monday thru Friday c/o Kirwin Becker Law Group at (805) 650-1044. Updates about our current disaster relief delivery and on-going education projects are posted regularly online at Twitter.com/KIRFaid and Facebook.com/KIRFaid. So, we give thanks this fall season for all of the wonderful work KIRF has been able to do this last year. Our work could not have been done without your very kind and generous support. Thank you very much for helping KIRF help others in need. Please feel free to send donations for disaster relief or KIRF India and other education projects to KIRF at the above address. You can also donate online at KIRFaid.org. Your donations are deductible because KIRF continues to be in good standing with its 501(c)(3) public charity IRS classification. I hope you have a wonderful Thanksgiving and holiday season!